The Beloved Belle is named after the wedding dress shop on the ground floor. It also has two apartments on the upper floors, which are accessed via the rear of the building. The Beloved Belle was inspired by the balconies in beautiful Bilbao, Spain. The end result, however, is quite a different look I think. More images in the Flickr album. Instructions available through Rebrickable. This is so cool. 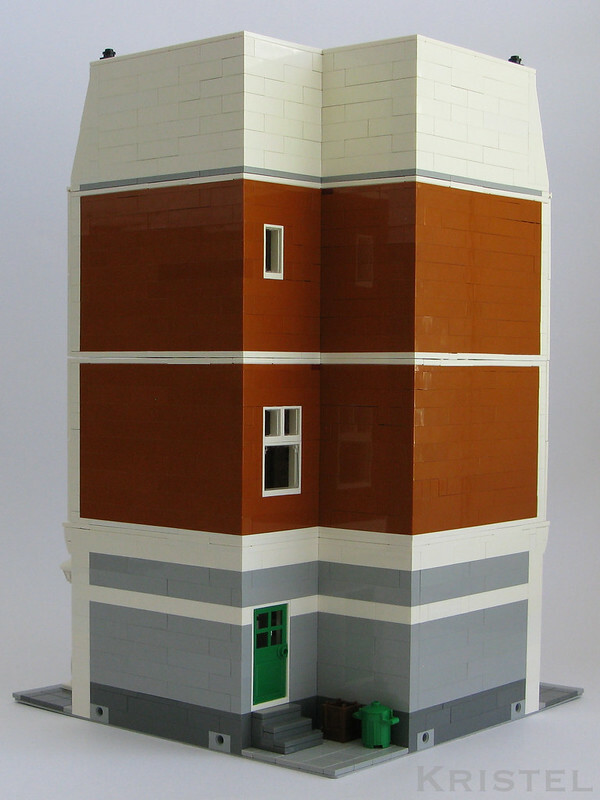 Hope you have submitted this to Lego ideas. I like this building, with Tan House one of my favourites. But I still can not make out how you attached the kitchen hood to the wall in the first floor? Thanks! Not sure if I should say “That’s awesome” or “I’m sorry”, but I’m going with the former! The range hood is sitting on a 2×2 plate that sticks out from the wall behind it. Your building are big inspiration to me. I spend a lot of time watching your pictures, thinking about how you do this and that and I learnt a lot. For example a like the way you build the upper kitchen cabinets to the wall – simple and clever. Wow!!! Love your builds! (As you can tell since I’ve ordered most of the plans. 😉 ) Speaking of which, when will this plan be available for sale? This is very cool!!! Hopefully not to far down the track …. This is just lovely, Kristel. The shop is so elegant and refined, especially the exterior. I did, however, have the thought that the apartment might be better as the third floor and attic, and the second floor could be where seamstresses are sewing the dresses and doing alterations for brides. It would also work to do that way without any apartment at all. Thanks, Karen. I like the idea of having the seamstresses in the same building. Another perfect building Kristel, you’re on point every time! My fiancée was particularly impressed with the bridal shop and I love the fact that it is a corner building with such a strong exterior presence with a soft interior. A 2nd floor seamstress would be excellent but may require 2 stairwells, one inside the store heading to the seamstress and a second separate stairwell to the apartment. You make a good point about the two stairwells. It would probably then make sense to have all floors as part of the shop – a floor for the bridesmaids’ dresses, a floor for the wedding gowns and a floor for the seamstresses. The attic could then be where they store old stock. Hmmmm, you could possibly keep both. What if the tailor was on a loft/mezzanine floor with a spiral stair case all within the store? This would also give the bridal shop a very high ceiling. Ahh the joys of this hobby! Thanks, Roloff. I’m looking forward to seeing your MOCs! Been visiting your site for a while now, Kristel. Love all your MOCs and this one is no exception. If you do make adjustments, please keep the photos of this version up! 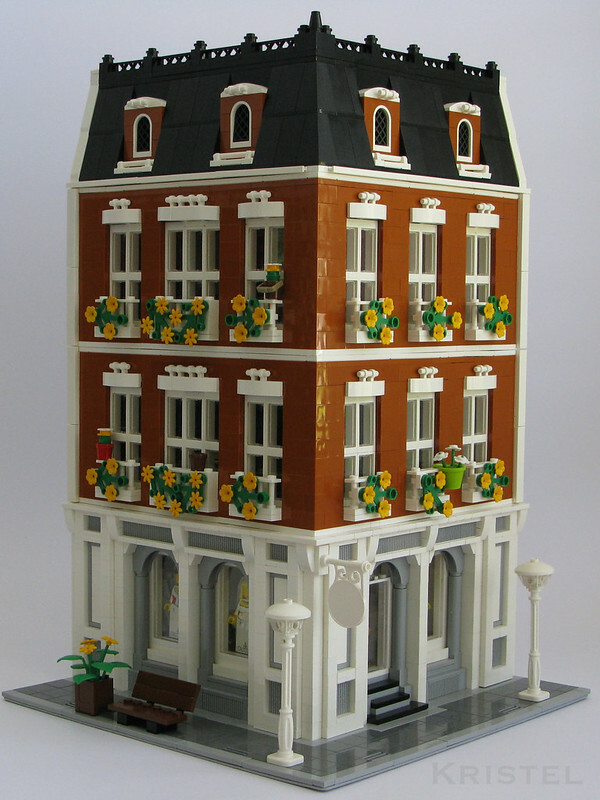 Unfortunately, this is the only one that is built at the moment, so I can’t show how it looks in a street view. 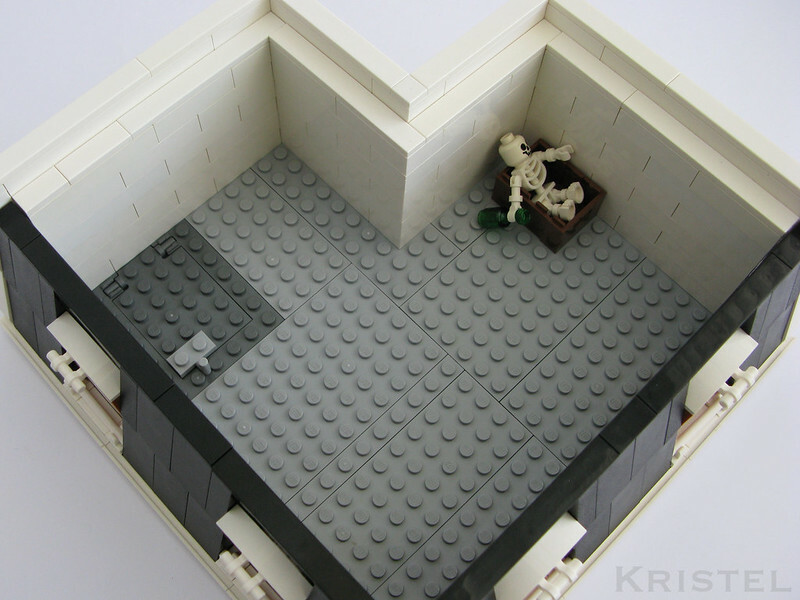 Another idea to consider: maybe one apartment that covers the the third floor + attic. (Bedroom could be the attic). Second floor could still be the seamstress/tailor and the stairs could all remain where they are. Lots of clothing stores have a tailor in the same building but as a separate business with unique ownership and similar/same business hours — thus the interior entrance to the secondary biz upstairs. The seamstress/tailor on the second floor could still retain the small kitchen and that simple half bath/fitting room for clients to try on shortened trousers/dresses, etc. Either way, love the building! Lots of great ideas coming through, but I will be keeping this one as it is. 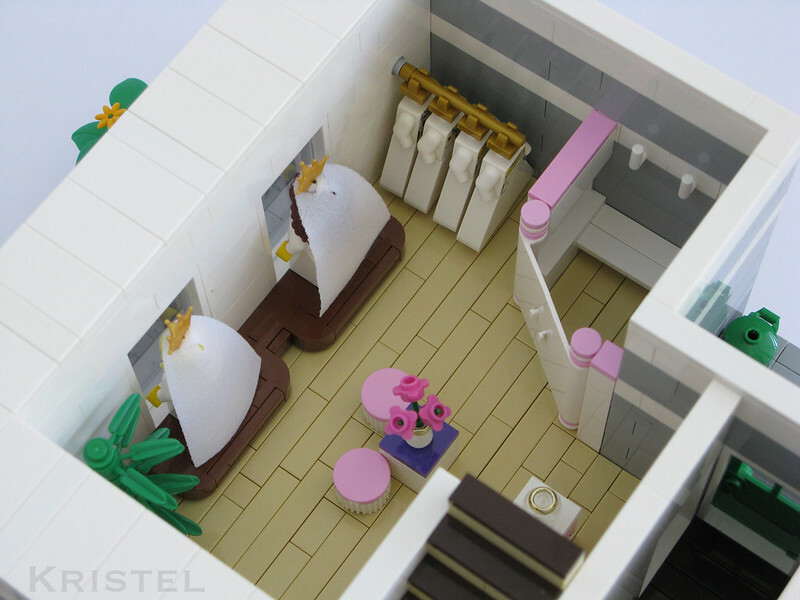 I’ll leave it to others to make it the way that they would like it – that is the beauty of LEGO after all! PS. Your comments don’t show up straight away as I have set them to be moderated, as the ratio of spam to genuine comments is about 10 to 1! Yeah! Maybe if/when you share the plans, I’ll mod it up! Thanks for sharing this awesome build, Kristel! Great job the exterior is pretty sharp! All your modulars are awesome, but this is like the cherry on top! Great work! I was also wondering how you plan and buy all your bricks. 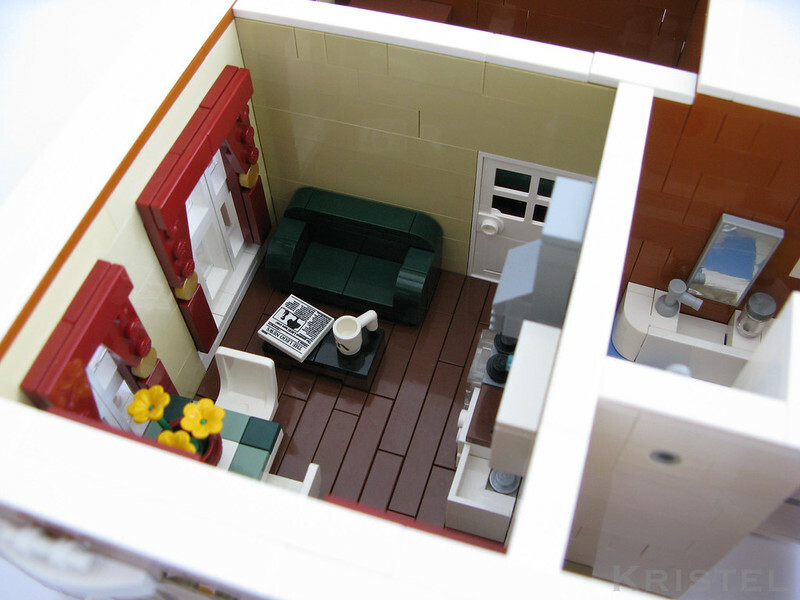 I have attempted custom modulars in the past but I always have trouble knowing what pieces I need. Do you have any tips? Thanks, Nathan! It’s funny you ask this particular question on this particular building because I actually misjudged the number of parts required twice and ended up need to do three BrickLink orders before I had enough dark orange pieces! I usually do a rough count in my head, but that is by no means a fool proof method. And it failed miserably on this particular build. Other options that are a little more accurate are first building it using whatever colour pieces you have at hand (I have a WIP on my table at the moment with some yellow and red pieces that will be replaced by dark tan when they arrive), or build it first in digital format so that the program can do the parts list for you (but this requires a little more patience). Sorry If I upset you with my commentary, but, could you please publish here the list of pieces to build this one? I´m in love with this building. 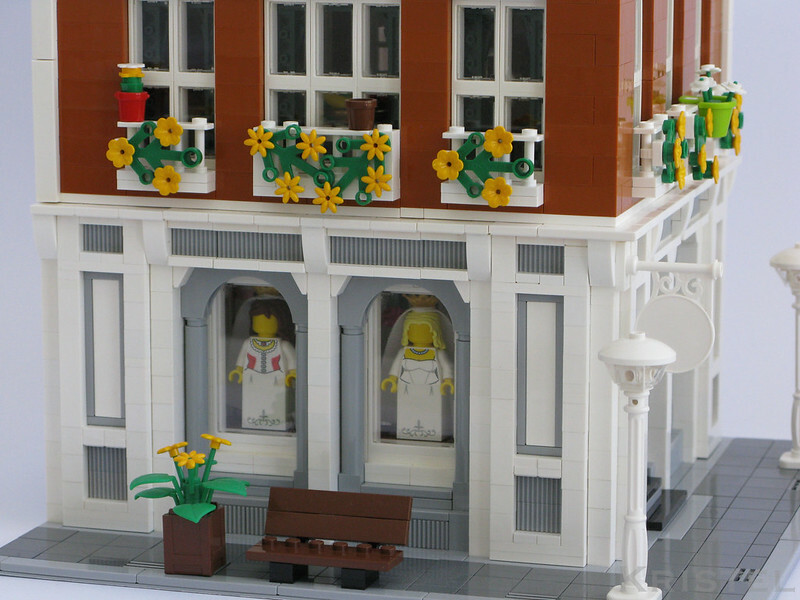 Edit: You can also now purchase the instructions directly through Rebrickable. 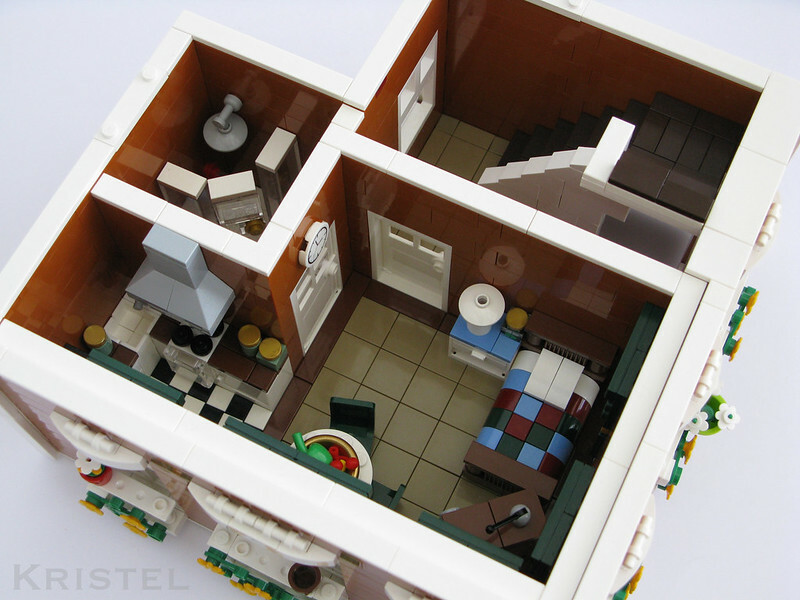 Your modulars are awesome, Kristel! Keep Building! By the way, I also like legos, too! You inspire Me! Another very-well-designed and appealing modular. It took me a bit to figure out how you made the thin grey trim around the pilasters on the ground floor exterior. Very clever! Thanks! The trims were a bit tricky, especially the ones on the corner..